I&D Consulting is pleased to have completed Spruce Plaza for Constanzo Investments. Working alongside MCG Architecture, Rick Engineering and Dasher & Tabata, the Spruce Plaza center is a 15,900 SF Restaurant Retail Center with outdoor patio space. 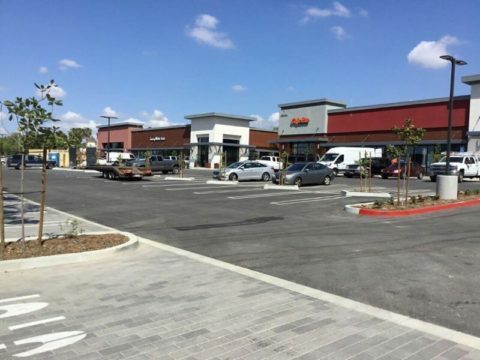 The $3.5M project, formerly a Chinese Buffet, involved the demolition/construction of the existing parking and 12,335 SF development, parcel map, major traffic and parking studies, sign program, and new dry and wet utilities including decommissioning Edison and switching to Rancho Cucamonga Municipal Utility. The site is located at the signalized intersection of Spruce Street and Foothill Blvd. New tenants include Café Rio, The Habit, Jersey Mike’s, Luna Grill, Blaze Pizza and Tokyo Joe’s. I&D is proud to have worked as the Owner Representative and managed the entitlements, permitting, dry utilities, tenant coordination and all coordination with the city and respective utility companies from initial project inception to final permit issuance.